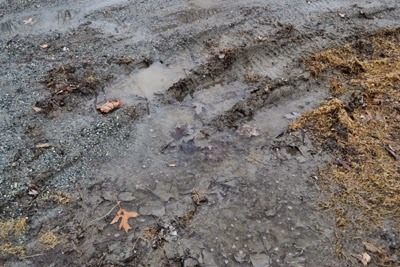 Where our driveway meets our road, squishy Vermont mud! When I first moved to the East, a new friend of mine told me about having five seasons here. We have the basic four: winter, spring, summer and fall, but we also have mud season. I had to see it to believe it, but it only took seeing a friend's friends push her car out of the mud to realize that it is a very real season to be sure. While they pushed her car and rocked it back and forth until it was free they all got covered in mud. It took such an experience to realize that people here are made of different stuff...inside and out. They are unafraid of mud and dirt and are loyal to their friends such that they know their duty and do it. I have found in the years that follow, Vermonters are truly courageous in other ways as well. Our castle has a moat too...only in mud season in Vermont! I don't make a good Vermonter to be sure! You have only to read my last blog to know that inside, I am a wimp at heart and easily scared of anything, mud and dirt included! Mud season isn't my favorite, though I still live here and mud season is again starting, though I prefer to call it Sugaring Season. The days grow warmer while the nights are still cold, though with global warming it seems that our days are still very cold and the nights colder still. 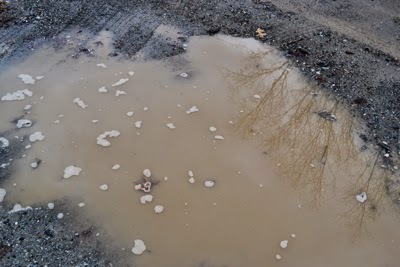 Our roads are getting squishy however and this is why we all have mud rooms in our houses...to take off our boots and disrobe. 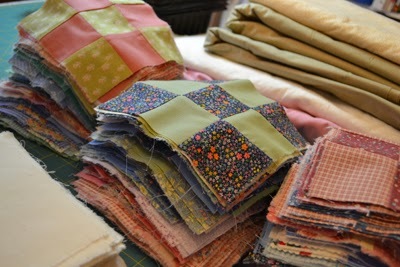 I focus on making quilt blocks instead of the weather outside! This same friend told me that seasons were created to make us balanced. "Winter is a time of reflection, and is good for the soul", he said. I found this a credible statement coming from a friend who was both priest and monk, though I have reflected on his comment regarding the seasons for years. Not skiing and skating like I used to and growing ever more thin skinned as I age, I have to think that winter is a good for something, and besides reflecting, I have found it good for Christmas as well as quilting or stitching comforters that keep you warm as you work on them! We have all had plenty of time for reflection this year and I am going to share some of my own reflections, though I must warn you that they are not as deep as my priest friend might have had in mind when he made his comment. For example, I have recently thought that I would like to be one of Maria Katz's chickens. I think their gourmet menu appealing. Only recently they received fresh strawberries all diced into chicken sized bites. Maria is also generous to sprinkle their main entrees with tuna oil. I have been laughing about Maria's realization that her chickens prefer cracked corn and bugs to her gourmet left-over scrap meals that she only imagined they preferred. Reflecting on this, made me think about how I treat my dog to snacks: a potato chip, a bite of cookie or cheese, or a cracker, though I know that my dog doesn't have the same taste buds that I do, besides which she takes whatever I give her in one gulp and it is gone...and then I realized that perhaps I eat in much the same way? I can only imagine what it would be like to put out on the table what I consume each week without the awareness I am doing so. How momentary the pleasure and I am reflecting on just how thin I could be. My dog and I like to eat as as way to break the monotony of our activities or simply as an activity for its own sake. It was a good realization, though it hasn't changed my diet in any way as yet. I have put it on the top of my personal reflections list. Perhaps one day I may benefit from if I only apply what I know? 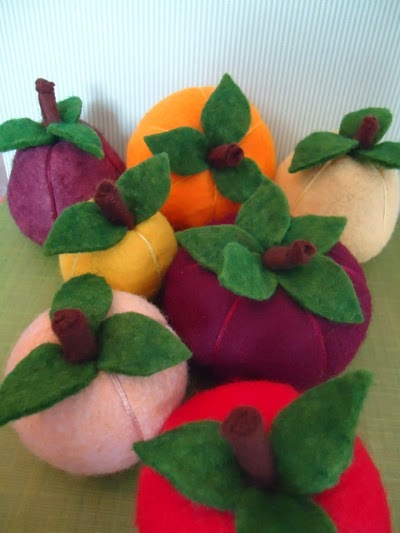 My fruit pincushions are delicious, but I envy Maria's chickens' gourmet diet. 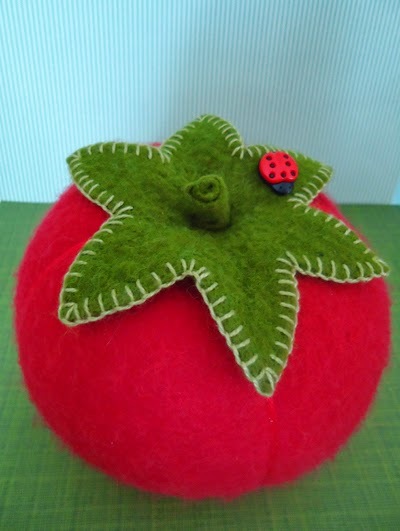 A tomato pincushion filled with walnut shell is a squirrel's and sewer's delight! 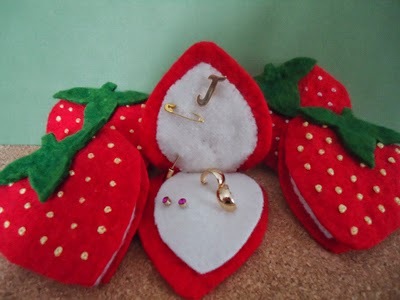 My strawberry needlebooks/earring holders are a treat many like. I have also realized that I might have been more foolish had I the means to be so. One of my friends wrote that he is getting a "turkey neck" and is shocked that living near Beverly Hills may be causing thoughts of him getting plastic surgery. I wrote back and listed all the work that I would have done to re-vamp my body if only I had the means! I could see right then and there just how superficial I really am! Perhaps God has protected me from myself by keeping our income low enough as to not allow me to be the foolish person I really am!... Oh, whoops, what about this year's find of E-bay? I reflect now that a woman and her meager earnings are soon parted...but the wonderful bargains and materials I have found!! Perhaps to one so foolish, more is NOT given? Mmmm. 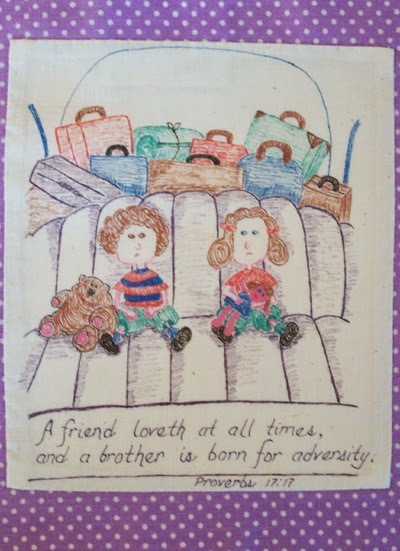 Now and forever my insensitive brother and me with a line drawn between us! Another realization hit when I was telling my daughter about my brother candidly admitting to me about how he had failed to raise his child to be sensitive to others. It was not hard for me to see that this might be the case, as my insensitive brother and I have been warring since childhood. I remember too well the time that I locked myself in my bedroom for protection, and he simply took the doorknob off, leaving me imprisoned until I took the screen off my window to escape (no, my mother wasn't home). But it was that same day that he confessed this to me, that my youngest daughter recalled the mean things that I have said to her that hurt her tender heart? "Could that have really been me?" I wondered? I had look-alike parents that would occasionally substitute for my real ones, that were mean to me as well. Perhaps this could have been a substitute look-alike of myself saying such horrible things to my dear daughter or perhaps there is a mean gene that manifests itself from time to time using my tongue to express itself and then another gene that is causing me to forget that it was me? Surely that couldn't be, but rather that my daughter is manifesting a paranoid gene that runs in our family and she has taken my well-meaning comments and twisted them as only overly sensitive, paranoid children can? Winter is a good thing, for how else would I have wanted to stay indoors with such inner thoughts to ramble 'round my brain? The truth be known that my present treatment of eliminating Vit D from my body makes me live indoors all the time, with little exposure to sunlight no matter what season of the year, causing me to moodle in my brain too much of the time...doing what people do in winter, year round? Reflecting is no doubt a good thing to do in moderation, but year-round might be considered morose and down-right depressing. Seasonal Affective Disorder? Perhaps people like me really need light therapy lest they stay submerged in the dark and gloomy inner sanctum that resides within each of us. And what was that my friend had said about their being five seasons of the year to keep us well-balanced? Mmmm....it is time to think about experiencing the other three seasons of the year? We have had enough winter and with mud season being a dirty time of year, I am ready for spring, summer and fall! Now that is a pleasant thought! Spring is beautiful here, with the ground greening all around us and the peepers singing! It is hard to imagine just yet, but definitely a bright and cheery thought! 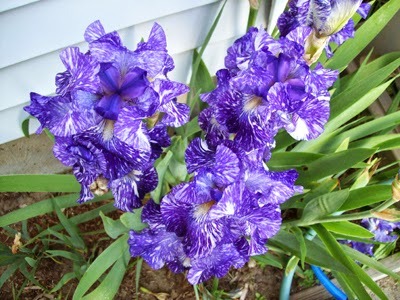 Just imagining the glories of spring and summer! Happy Spring and Easter/Passover Season to you all! 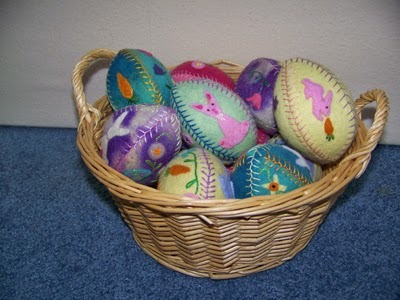 My felted wool Easter eggs. May be special ordered.